The 95 price level for USD/JPY has served as very strong support over the past few months and now that the currency pair is trading well below that price level, it appears that the floor is caving in. The following chart illustrates the significance of the breakdown. 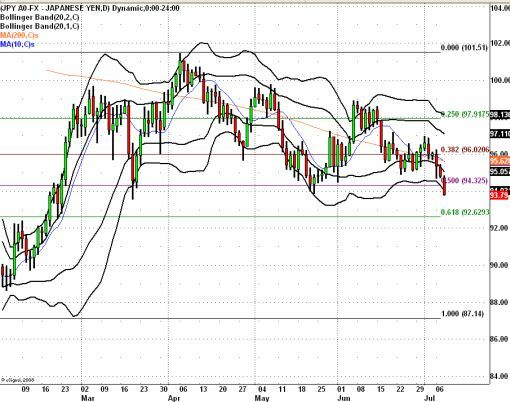 USD/JPY is trading in sell zone, which we determine using Bollinger Bands and the break of the 50% Fibonacci retracement of the January to April rally that took the currency pair from 87 to 101. The 10-day SMA is also crossing into the 200-day SMA suggests that USD/JPY could fall as low as 93. What is driving the move in USD/JPY? 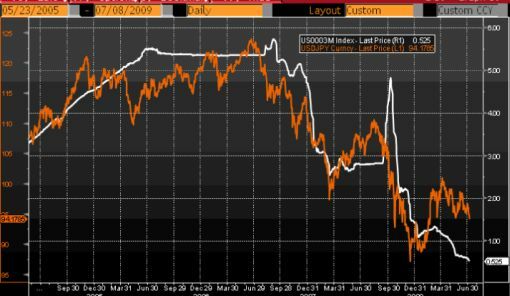 Yesterday, I posted a chart of the correlation between USD/JPY and U.S. Stocks. The S&P 500 erased its earlier gains and is now trading in negative territory which explains the latest breakdown in the currency pair. Here’s another interesting chart that confirms my belief that USD/JPY is headed lower. Three month LIBOR rates are slipping and USD/JPY has an uncanny way of trailing short term rates.